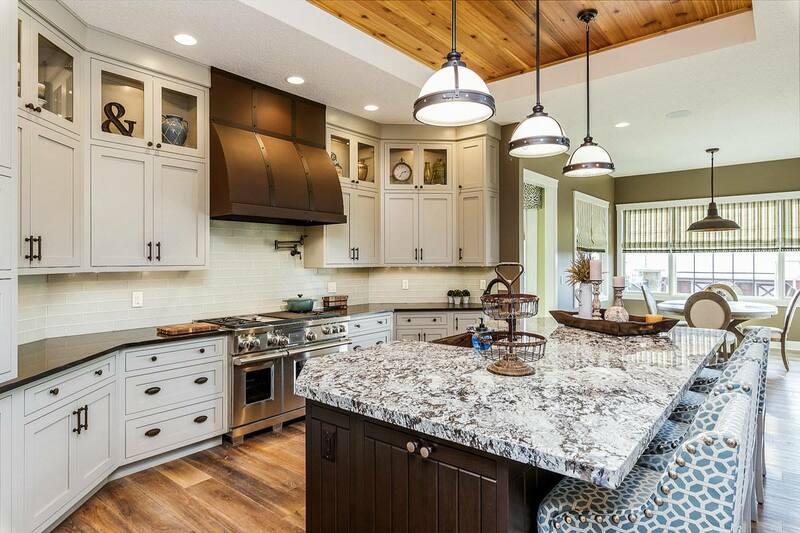 This week’s featured project is a brand new home built by Bob Walter Homes in rural Iowa. 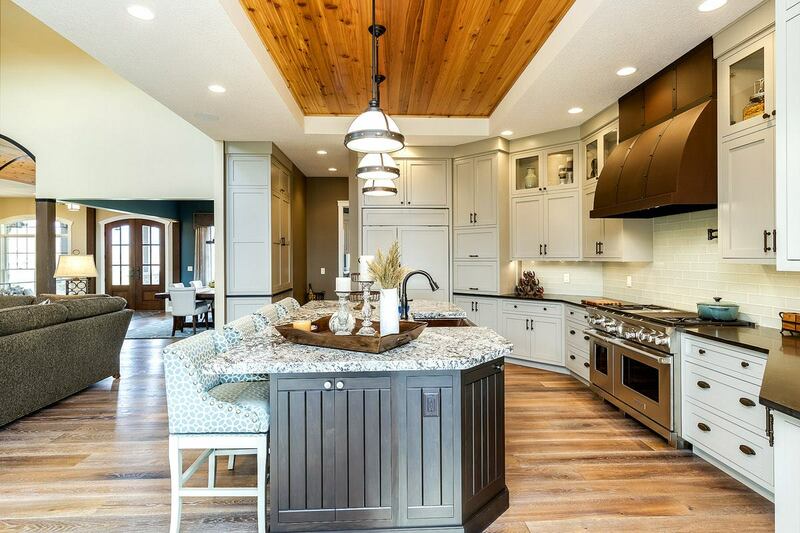 Bob Walter, known for a tradition of excellence, has truly built a gorgeous home! It was a huge pleasure to work with him and these clients to design and provide the cabinetry and lighting for these spaces. We hope you enjoy taking a look around this stunning new home. A non-beaded inset cabinet with 5-piece drawer fronts in the “Fairfield” door style lines the perimeter of the kitchen in a Maple wood custom painted with a Sherwin Williams color named “Balanced Beige”. Dovetailed drawers throughout with undermounted full-extension solt-close drawer guides. The inset doors have concealed inset hinges with soft-close feature. The kitchen island is constructed of a doorstyle named “American” also inset into the faceframe. A Maple wood has been stained in a medium gray “Tarragon” finish. 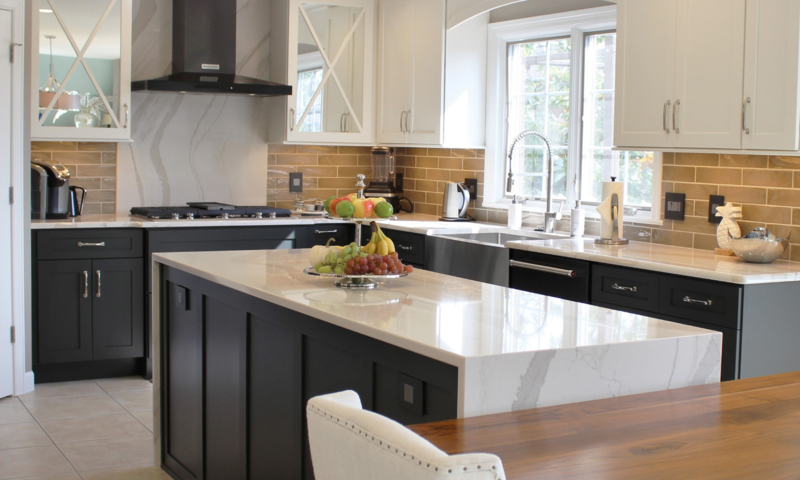 We love the pairing of the cabinet finishes with the varied wood tones in the floors. 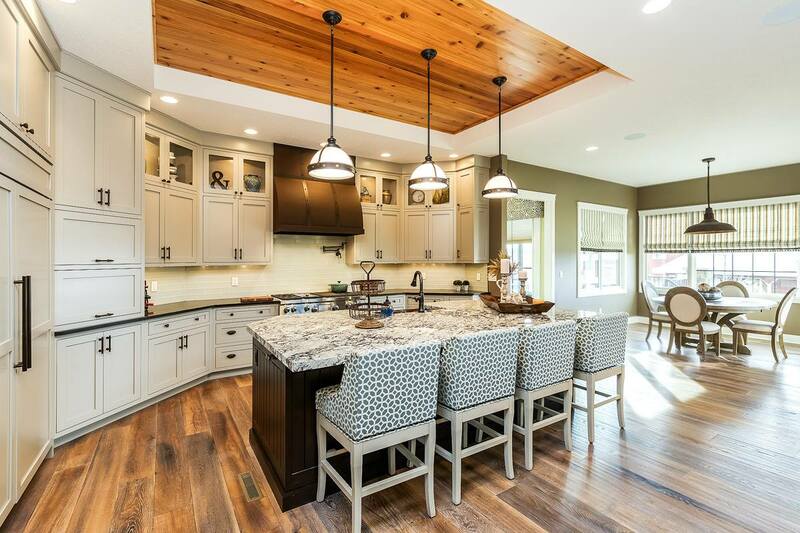 The kitchen is from our Custom Amish-made line of cabinetry Das Holz Haus. Located out in the beautiful plains of Illinois, this custom cabinet line is our finest available. From our designs DHH is able to create a superior product with attention every single detail. We take great pride in providing this line to our customers. Knowing they are investing in the very best available and their cabinetry is constructed as an entire project, not piece by piece. While our clients may be investing in this line for construction, what’s outside is not to go unnoticed. The same “Fairfield” doorstyle from the kitchen is repeated in the Laundry Room but this time a paint named “Knitting Needles” is applied. 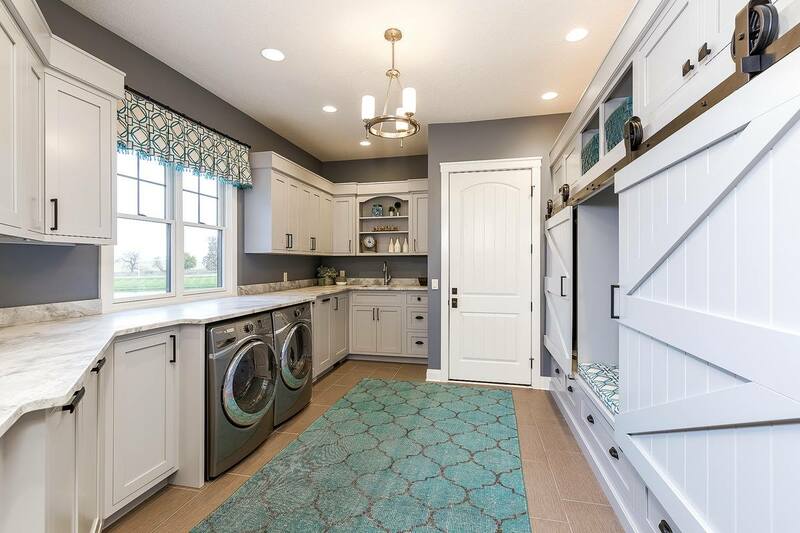 This space is ready to not just act as a laundry room but so much more. An incredible amount of storage throughout including a bench area with storage drawers below. We would guess you aren’t looking at the storage drawers below now though…. 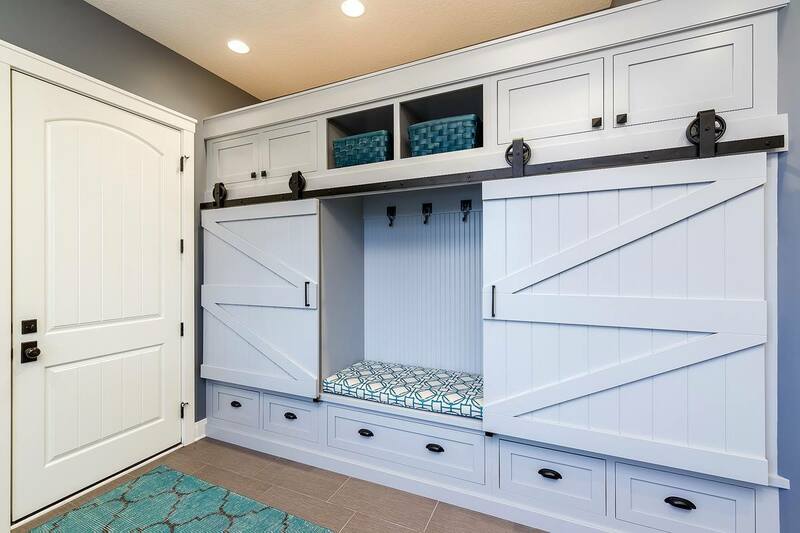 how about those custom barn doors!?! If including a barn door in your space is on your wish list then don’t hesitate to discuss it with your designer at Village Home Stores. We can make your dream space a reality! 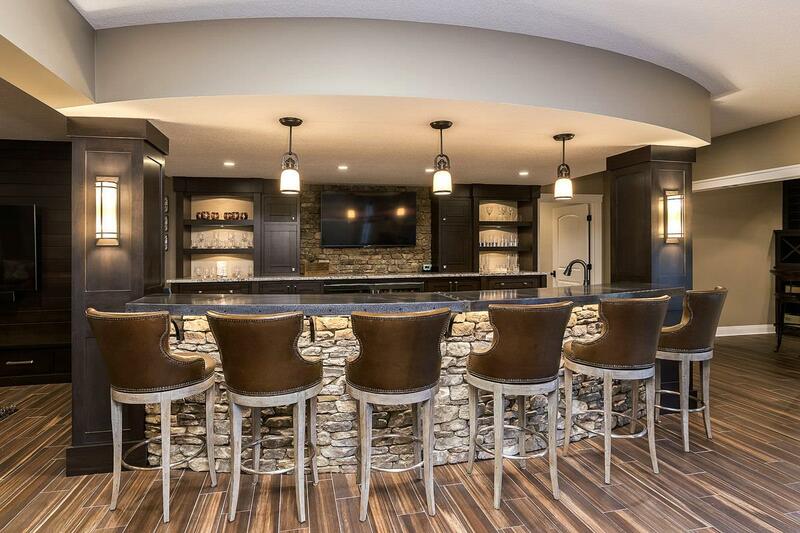 We didn’t just provide expert design and custom cabinetry for this home we also provided the lighting. Including open concept layouts into new homes has made a big impact on the importance of creating a cohesive style to your home. Our new home lighting specialist works closely with you and your budget to help determine your own personal style and tastes. We carefully consider location, scale and how well fixtures near each other can compliment the overall look. The images above represent what fixtures were selected for the lighting visible throughout the Great Room space. (left) The Foyer light by DVI Lighting is in Oil Rubbed Bronze and the Dining Room lighting (center) is a series from our Kichler line that includes rustic wood details. A 15-light chandelier (right) hangs in the center of the Great Room by Feiss. In the lower level of the home we provided lighting and custom cabinetry. 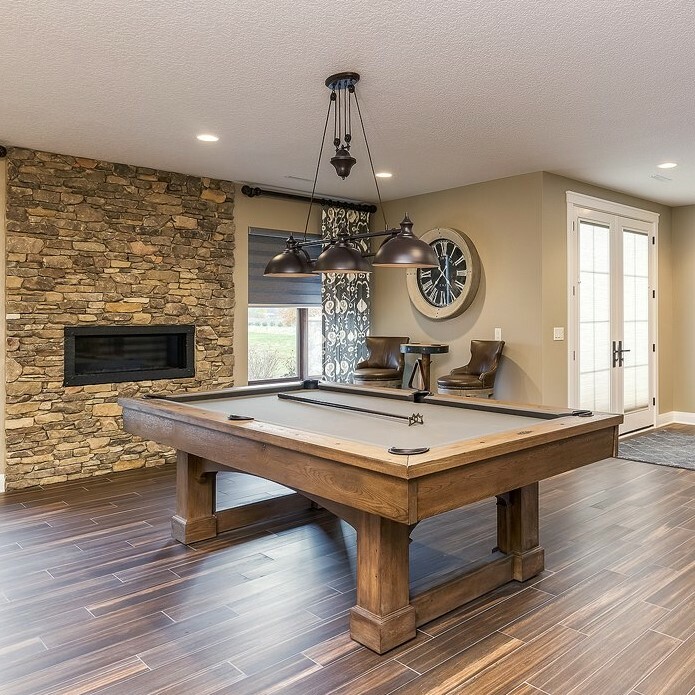 How amazing does this farmhouse style billiard fixture look above the table!?! This 3-light fixture from our ELK line includes a centered pulley to raise and lower the unit if needed. 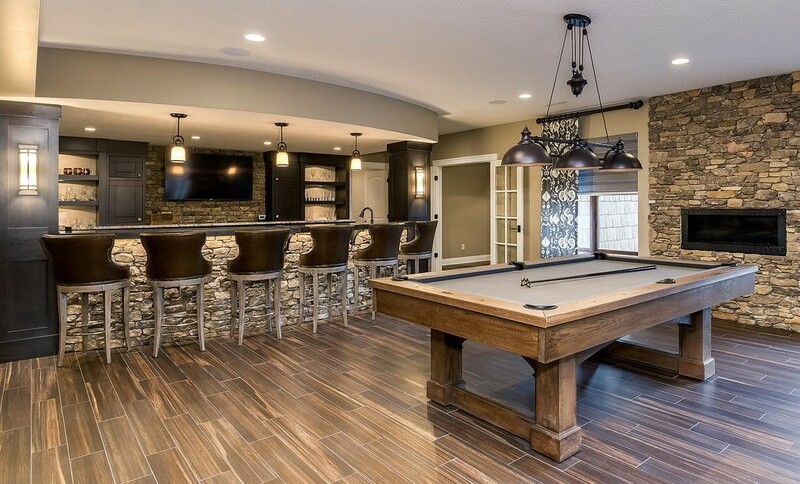 Just beyond the billiard table is a stunning new home bar area. The “Athena” door is inset and stain in the same Maple “Tarragon” finish from the upstairs kitchen island. 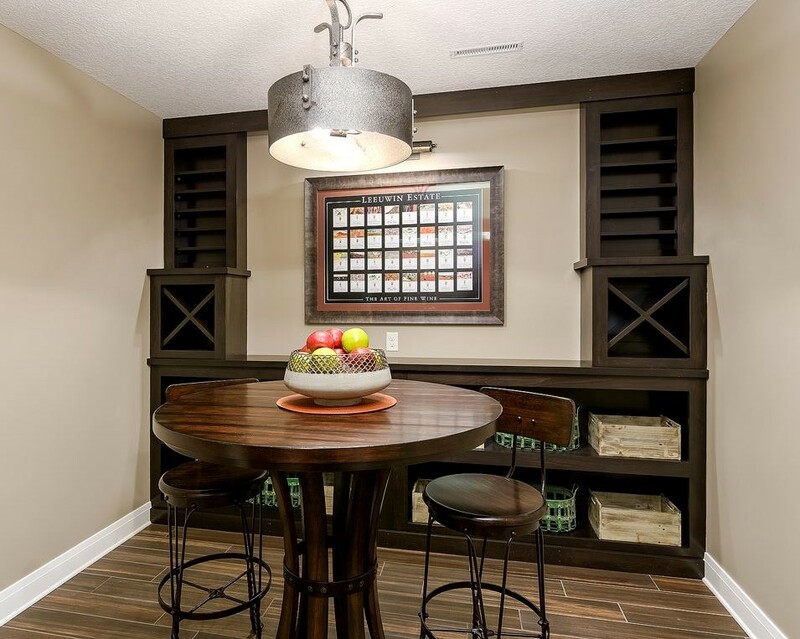 With closed storage and plenty of open shelves this home bar is gorgeous! This space would make even a stylish NYC bar owner jealous. The layout, the details, and the lighting all make the space so polished. 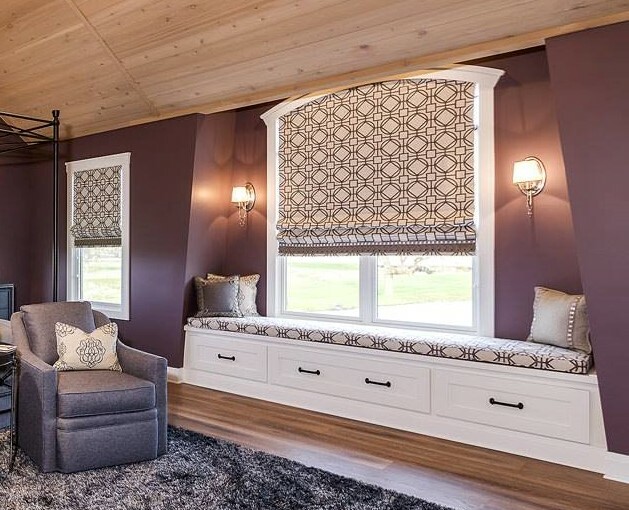 Pendant lighting from our ELK line and wall sconces by Feiss complete the look. We are certainly ready to pull up a barstool. But if sitting at the bar isn’t your thing perhaps visiting this Wine Cellar area is? The “Leland” 3-light metal drum pendant by Uttermost is a great centerpiece to the space. Of course all of the bedrooms need to have a stylish lighting plan in place as well. 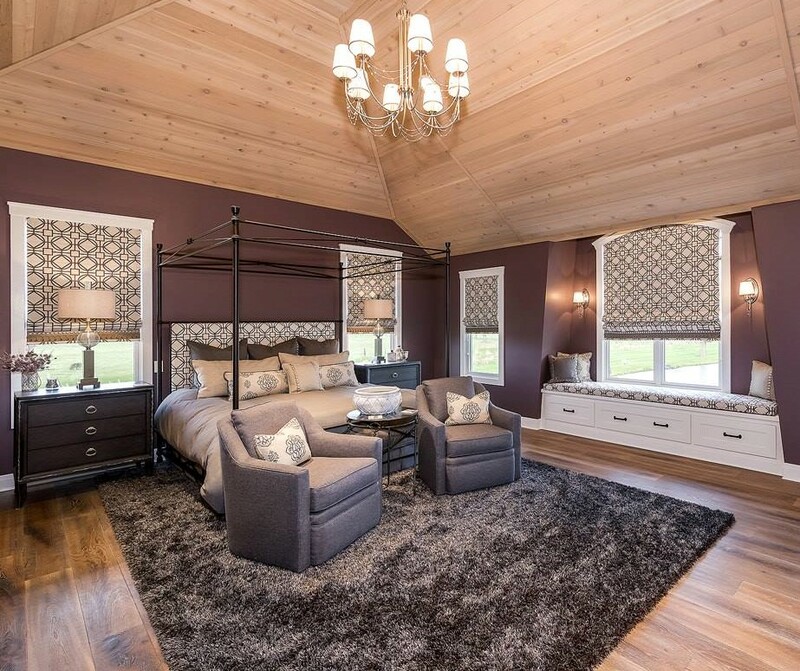 Our favorite is the Master Bedroom which includes the “Aveline” mini chandelier by Feiss. Elements Home Furnishings and Interior Design did an incredible job stylish this home. 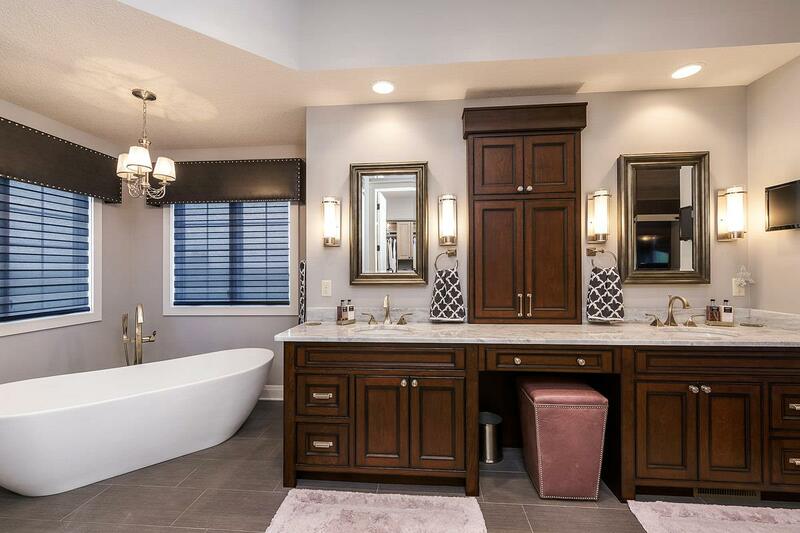 We are in awe of this completed Master Suite. Two wall sconces flank a built-in bench area in the Master Bedroom. The 1-light sconces are from the same series of lighting named “Aveline” by Feiss. In fact a third light from that series is repeated above the tub in the Master Bath. Wall sconces by DVI Lighting flank the framed mirrors. 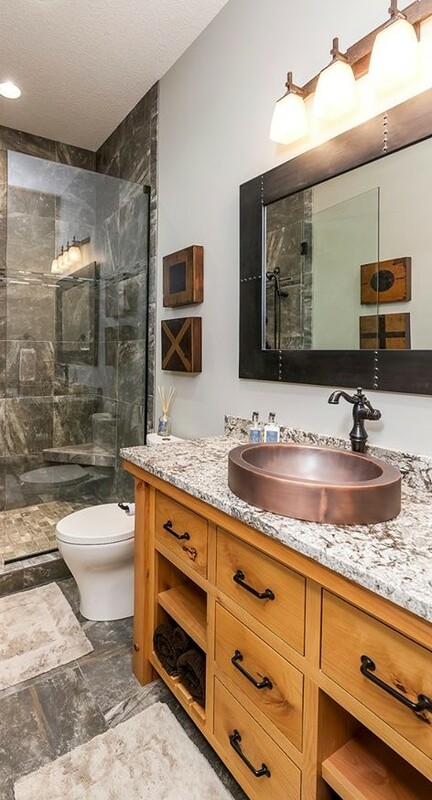 The Master Bathroom vanity area is designed using DHH’s “Villa” door in a Cherry wood. The rich, warm stain is named “Amber” and includes some distressing for added detail. 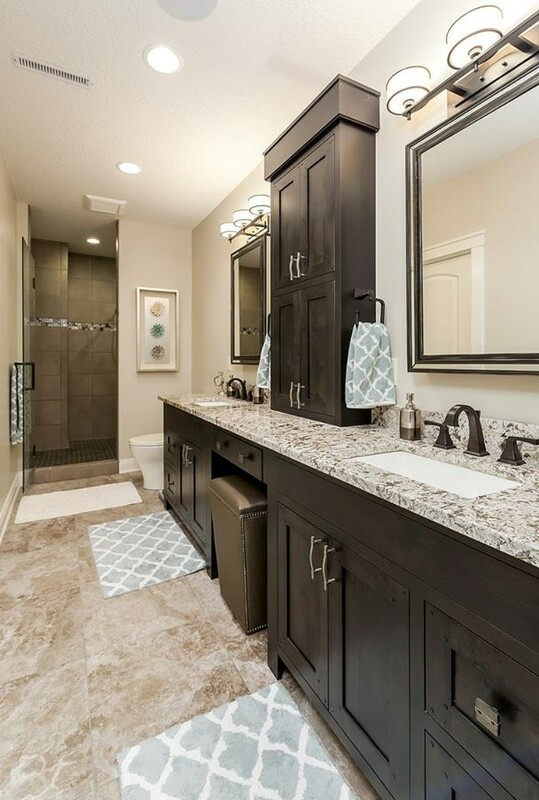 There were a number of other bathrooms in this home but we did want to share some of them to give you an idea of the variety of styles we can and do see in new homes today. 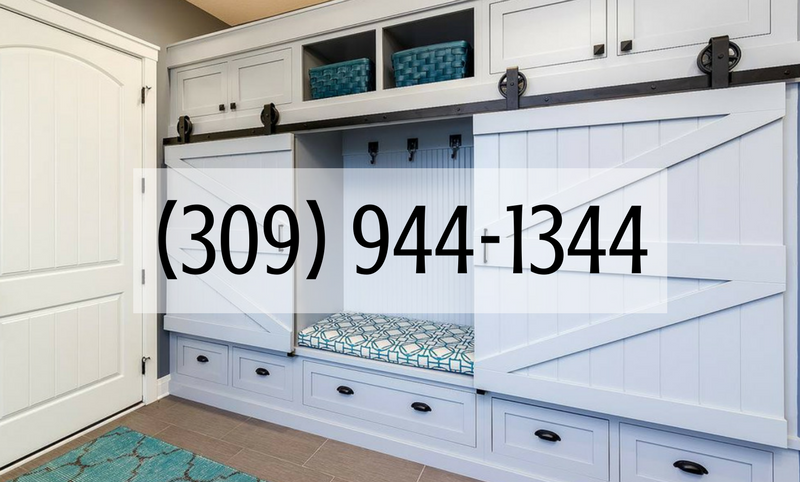 Gone are the days of ordering one door and finish for an entire home of cabinetry. Instead, we are excited that every space in a home is now treated as it’s own concept. The main Guest Bathroom cabinetry (above) is the same doorstyle as the kitchen. Knotty Alder wood has been stained in an “Anise” stain. A new detail to note is look closely at the corners of the cabinet doors. These doors are still inset in the faceframe but raised pegs have been added for an extra detail. That same Knotty Alder wood is repeated in the main floor hall bathroom. This time the alder is stained in a color called “Sand Keepsake” with a heavy distressing applied. Open shelves give a more furniture look to the vanities and the copper bowls on top are beautiful. The lighting you select for your home becomes the “jewelry” of the entire finished look. Our lighting experts will help guide you and keep you on track for what is needed and what will work best for the space and your project’s budget. 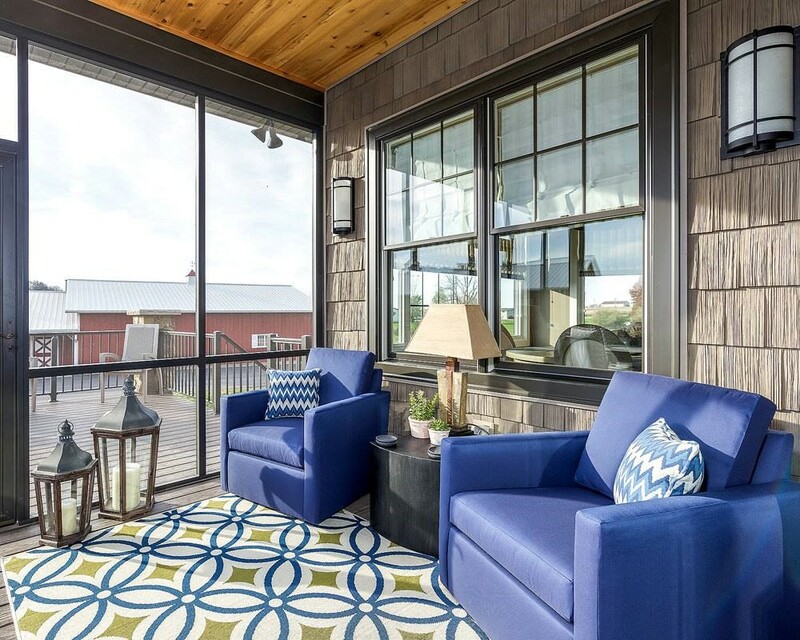 This home also includes a relaxing Outdoor Living Room space we provided lighting and fans for. These lanterns are from our Minka-Lavery line. 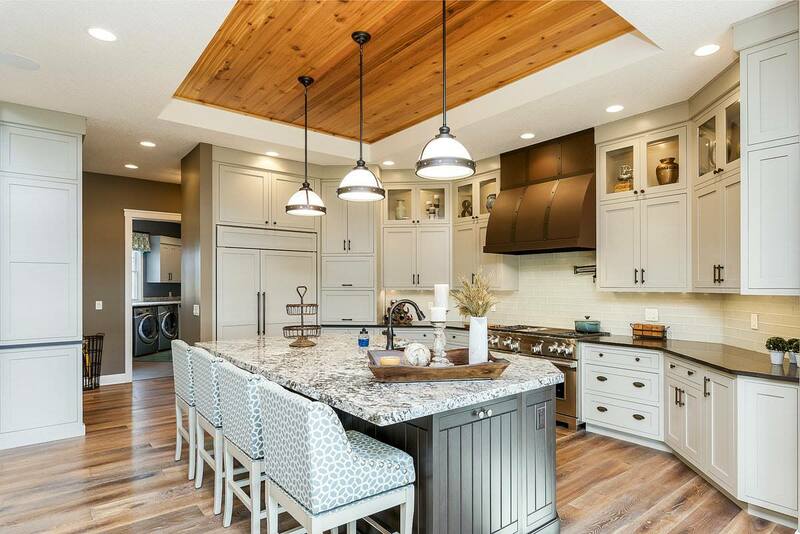 To learn more about Bob Walter Homes and see an up to date listing of properties and communities available visit their website here at this link. We are so thankful that Bob Walter Homes partners with Village Home Stores on projects like this home. It was an absolute pleasure to design this home and all of the spaces within it. 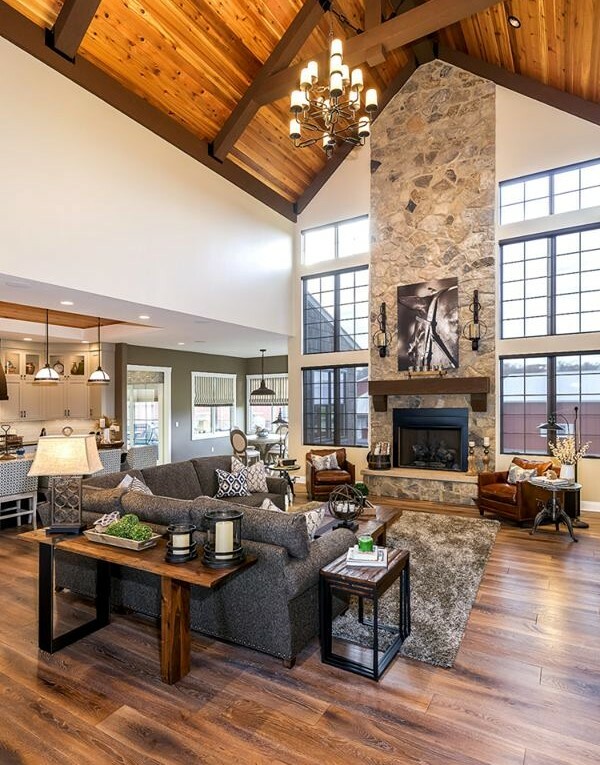 Our thanks to Elements Home Furnishings & Interior Design for doing an outstanding job of styling this home. Find out more about Elements here on their site and be sure to follow them on their Social Media sites for great style inspiration. 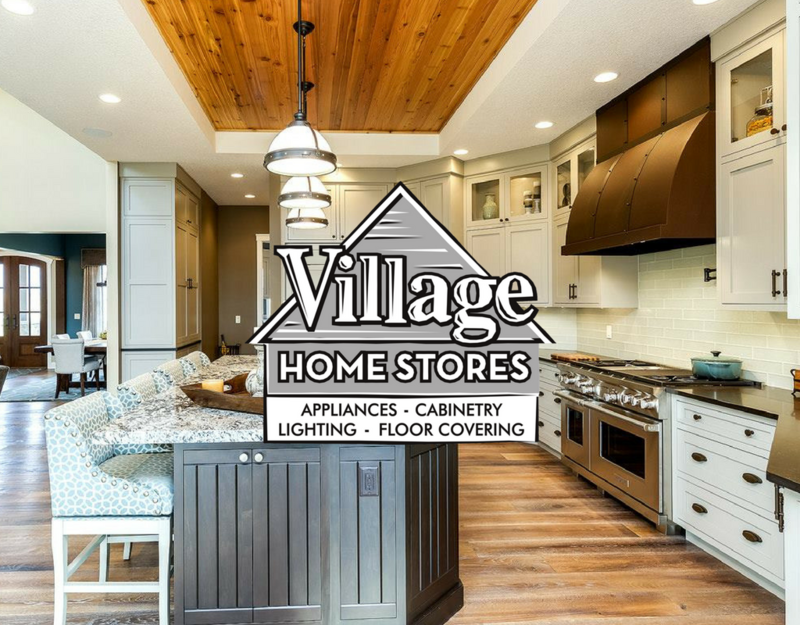 If you are ready to start the conversation about your project with Village Home Stores contact us today by completing this short online form or calling us at (309) 944-1344. We can’t wait to hear what you are working on. Next PostNext Rock Island, IL- A Kitchen Customized But Not Resized!